I’m lucky enough to live very close to a fabulous local fruit and veg shop and I am really enjoying stocking up on seasonal fruit and veg at the moment. There are some amazing fruits in season (such as cherries and strawberries) which means its an ideal time to make smoothies such as this one. 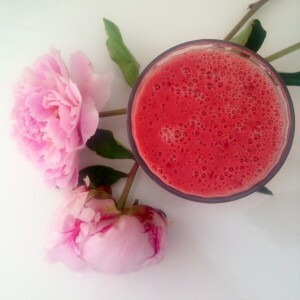 I had so much fruit that needed using up this morning and, as a result of that, my blender, and a desire for a pretty breakfast….this smoothie happened! So delicious, vibrant and feminine with its gorgeous pink colour, I just had to share with you all. 1 tsp Manuka Honey if you have it, for extra healing-ness! Prepare the fruit and pop into the blender. Whizz it up until its smoothie shaped! This recipe makes plenty for a couple of large smoothies. I haven’t listed exact amounts because it is one of those recipes where you can be flexible and use whatever you have left in your fridge. So add as many berries as you wish! I used half a punnet of strawberries, about two cups of watermelon and a large handful of cherries (don’t forget to remove the stones). 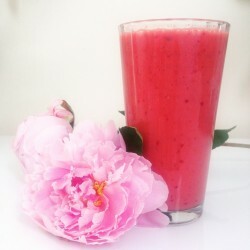 Let me know what you think to this pretty summer smoothie. This looks delicious, it has my mouth watering. I have to try it!